Forklift trucks are an invaluable piece of machinery to factories, warehouses and other industrial premises but they can be so much more versatile with the simple addition of attachments. We take a peek at the most popular attachments available, and what uses they can have for you and your company. 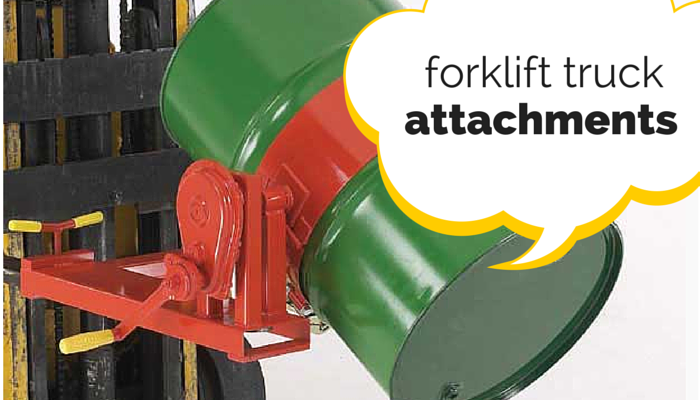 Forklift drum grabbers are designed to grab hold of the drum being transports round the rim, allowing it to be moved quickly and safely with maximum control of the drum, which is especially useful if it contains flammable or hazardous substances. Some of the attachments even feature a suspension system offering extra peace of mind. These are ideal for warehouses and large storage facilities. Forklift drum hoists are mainly used in industrial environments where liquids have to be transported (especially hazardous). The drum hoists work by holding onto the drum by the rim and lifting the drum up, some hoists have an arm that steadies the drum whilst in transit. These are ideal for manufacturing environments and factories. The forklift drum clamps are simple and easy to use, they simple clamp round the drum you are moving. Used mainly for moving around stock and stored items or ingredients, these are found mainly in warehouses and large storerooms. They are also great for loading onto vehicles ready for distribution. The forklift tilters and rotators are an integral part of loading and distribution, as drums sometimes need to be loaded on their side, which is where this handy attachment comes into play. Both the tilters and rotators allow the driver to maintain full control of the drum without having to leave his seat.